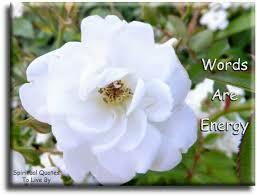 Among philosophers and physicists is a theory that the fundamental nature of reality is energy. 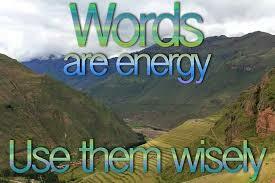 On a more day-to-day level, this would mean that our words, yes, even our thoughts are energy too. Think about it! Words create waves the same way that a note of music ( and I would add, or a jackhammer), creates waves… And here’s another key takeaway: when we are conscious of the energy behind our words, we become capable of making beautiful music in the world instead of a noisy disturbance. No surprise, that awareness, being conscious, can make all the difference! Up for experimenting? Try this to increase sensitivity to this notion: simply make a list of your favourite words and notice the energy they contain. Write or speak them, and feel them reverberate in our bodies and in the air around us. Becoming aware and practicing this way is kinda like learning to consciously play an instrument that we have been playing unconsciously for most of our lives, and the effect can be startling and insightful. Some favourite words of mine include: heart-warming, gratitude, touching, wisdom, learning, meaning, compassion, listening… and some thoughts that flow through me with some frequency include criticism, judgment, wrong, stupid, “how could they”…!!! How interesting, actually startling, to feel into the resonance of each of these in turn…to feel their vibration as a thought, and then as a spoken word. For me too, another familiar theme then arises. If I want to make music, and not create dissonance with my written or spoken words, or even thoughts, I need to slow down, take a breath, notice what’s going on… OMG, yet another reminder to be in the moment, be present, be HERE – NOW! 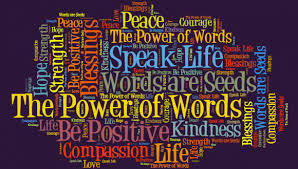 Our words, our thoughts, are energy. What comes up for you when you try this experiment? I’d love to hear. We’re in this together!